Protect your Samsung Galaxy S9's screen from harm and keep up to date with your notifications through the intuitive LED display with the official blue LED cover from Samsung. Only hold one or two cards, I can't seem to answer the phone by swiping on the cover, and I no longer see the time when I charge the phone on the wireless charger. I did not receive my order and emailed customer service heard back from them right away they did everything they could to find my order and ended up sending me another one as i hadn't receive my original order. I needed to trust who I bought my cover from as I love my new phone, I was not disappointed as my cover matched up well to my phone. Happy customer . No recommendation due to the weak magnet and therefore no sufficient mobile-protection, which is the main reason for buying such a product. Had one of these about 2 years ago and loved it. Still a good case, like the features, but now realised that notifications only cover messages received by text - nowadays I receive more WhatsApp messages than texts and it doesn't notify me of them so wouldn't buy again. I kept buying cheap phone cases, but they kept breaking. My husband recommended this one. Its brilliant, I can see the time and messages through the case. its a great case!! great team from mobile fun! Very nice case! Awesome and also the guys from mobile fun! It not value for money, but look nice. Item does exactly as described. I feel it is quite roboust. Not flimsy. Would recommend. Have bought two covers previously for older phones and find them great. I love the sleekness and how slim the cover is. The case is smart and elegant. It is not bulky like some so fits neatly in my car phone holder. The wallet has an LED display on the front, displaying time, charging, custom patterns for incoming callers. It is touch sensitive to answer calls and sleep alarms. You can talk with the case shut. All fresh gimmicks that also make the phone simple to use. If it could fold to make inro a stand then it would be unbeatable. I would have liked to have a thin screen protector coming with this. Has this stopped working for anyone yet?? I had one of these for the S7 edge and it stopped working after a few months. Has this happened to anyone yet? There is a little cable that runs through the edge of the cover that snapped. This case feels nice to the touch and looks good. Easy to open with no catch to undo. The case does not provide the protection of some other cases but is adequate for the purpose. The Samsung Glass being tough compared to other phones. A bit pricey but a cool case. Mobile Funs service is great and cases arrived very fast but unfortunately its not a great case. It needs a clip or something to lock it in place because when the phone is placed down flat the case keeps lifting back up. The display is not great either, good for calls and time but ive to keep opening the case to see if i got any app notifications as i cant see the screen or the little LED notification light. 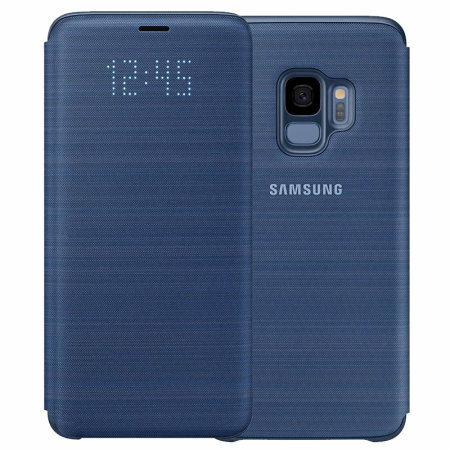 This case seems to be an improvement to the equivalent S8 case. The slightly ribbed texture gives it a nicer feel and less likely to slip through your fingers. All round protection with the sides of the phone fully covered and protected. mutt wife loves the LED lights on the case. worth the extra cost ps everyone wants one who sees it. I have a Galaxy S9 phone & this case fits extremely well. It's really light & compact. The purple color is lovely & the material helps you hold it. I just love it. I would highly recommend it. Love this phone case. I'd spent so much money on cheaper cases that didn't do the job or broke easily. This case is robust and works great with my S9 and well worth the extra cost. Love the LCD screen. Very impressed. Fast delivery. This case is stylish, and compliments the Galaxy S9 perfectly. It's great that you can choose various LED patterns for different types of incoming messages, so be aware of what's incoming without opening the case. With an in-coming call you can swipe the cover to answer, and talk without opening the cover. Excellent piece of kit. Looks and feels great. High quality. Offers great protection without being bulky. Stylish ???? H o w long it takes to arrive ,extra costs,what to do if exchanging product. This is an awesome cover for the Samsung S9. It's definitely worth the investment. Get yours today. You won't be disappointed. Everything about it is very good, the only problem is the material used . As much as it looks great, it is very difficult to clean. This cover is amazing. Worth the money. This product is amazing. I absolutely love it. Feels great on my phone and the LED function works perfectly. I've received so many compliments. Amazing technology, powered by NFC from the phone but it works for 15-20 seconds then it's gone until I reboot the phone. it is a beautiful piece of equipment and a pleasure to hold in your hand. Since I had it I have hardly used my wrist watch. Excellent. Tough. No problems so far. Calls can be answered and ended without opening the cover. This is an expensive case but worth every penny - is a fantastic case offers great cover without being heavy good protection you can reach all the buttons no problem the best buy highly recommend. LED an additional bonus. if you have a good quality phone it deserves the best possible protective case and this is it in my opinion. Does exactly what it says on the tin. Mind you it should do at 50 quid. great device to accompany my S9..Smart, neat and doea a great job. I like the one card holder in the inside of the outer cover. Very handy. a much improved case than the S7 .Would have given it 5 stars but i am waitin to see if like the S7 after a software update the LED stopped working,other people seem to have the same problem,I will rate again later if no problems. it would be nice to have the option to display more info such as text and email senders. I'm really pleased with this product - it's exactly what I was expecting from the description on the website. MobileFun's video reviews were really helpful in helping me decide what to buy. Best phone case ever. my daughter loves it, time & notifications are displayed through the cover. Case colour matches the phone perfectly. A 5 star product. Excellent cover. Good protection and very good looking. Gets lots of jealous looks especially from iPhone users! Love this wallet phone cover for my new Samsung galaxy 9. The screen is neat. Has so many options. Shows the message symbol when you get a text and phone number when you get a call. You can take it or decline it without ever opening it up. I went for the "official" Samsung product for my new handset and I wasn't disappointed. Description told me everything I needed to know.